The Text Module is not only the most used module for adding content, but it's also the one with the most accessibility concerns. Perhaps the worst thing you can do with the Text Module is to paste content copied from other sources like a web page, Microsoft Word document, or PDF. Doing so can include non-compliant code. To remove such formatting, follow this directions to clear unwanted styling. Accessibility requires a logical heading structure, which means each page must have one level 1 heading (H1) and then follow a logical hierarchical structure from there. This means no skipping (e.g. using H3 when there are no H2 headings on the page). 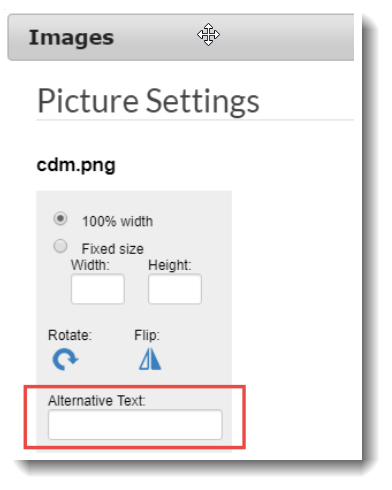 To properly create headings with the Text Module, use the Style menu to select an appropriate level heading. Do not create headings by simply using larger, bold text. Note that the Title Module also has formats with headings H2 through H5. The text you use for links should be unambiguous. See our separate article on Accessible Links. Images will typically need alternative text and generally should not include text. For reference, see our article about the Image Module. It is important to appropriately use header columns and rows. Tabular data will often use headers. Tables used to control layout never use headers. See our article on Accessible Tables. When you click the Table button on the toolbar, you'll be presented with 12 options. Those with the solid black cells represent header rows and columns. 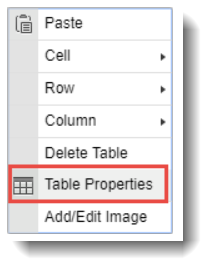 To change the format of a table, right click on the table and select Table Properties from the menu. To learn more about creating accessible tables, check out our Easy Start Guide for accessible and responsive tables. Use the numbered list feature rather than manually typing out numerical list.